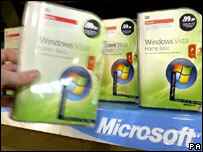 Customer demand has forced Microsoft to extend the shelf life of Windows XP by five months. Microsoft was scheduled to stop selling the six-year-old operating system on 30 January 2008 to leave the field clear for Vista. Now the date on which many sellers of XP will no longer be able to offer it has been lengthened to 30 June 2008. Microsoft said the change was to help those customers that needed more time to make the switch to Vista. In a statement Mike Nash, Microsoft's Windows product manager, said: "...maybe we were a little ambitious to think that we would need to make Windows XP available for only a year after the release of Windows Vista." He added that most of the other operating systems that Microsoft has produced were available for about two years after a new version shipped. The newest Microsoft operating system, Windows Vista, had a staged release between November 2006 and late January 2007. In some quarters Vista had a lukewarm response and in April 2007 PC maker Dell was forced by customers to re-start sales of computers with XP installed. In January of that year the computer firm switched to Vista on almost all of the machines aimed at home users. Software giant Microsoft does run a scheme that lets people rollback installation of Vista business and ultimate edition to Windows XP by ringing a customer support centre and getting an activation code. Microsoft denied that the policy change was due to slow demand for Vista. Mr Nash said that up to the summer of 2007 Microsoft had sold more than 60 million licences for Vista. This put it on track to be the fastest selling operating system in Microsoft's history. The XP date change applies to retailers and other manufacturers who sell Microsoft products. Independent firms that use Windows XP when installing and maintaining computers and networks for businesses can continue to offer it as an option until 30 January 2009. Microsoft is also extending the availability of the cut-down version of XP, called Starter Edition, until 30 June 2010. It said this was because it was seeing increased demand for the software to run on low-powered devices made specifically for the developing world.